Welcome to Wellness Wednesdays, where I bring you all things geared towards wellness of mind, body and spirit. Meet Hemalayaa Behl, inspiring yogini who is focused on shifting the internal paradigm of women everywhere, including myself. I met Hema around 2010, while managing the Dancing Shiva Healing Center. I was automatically drawn to her warm and inviting nature. I've been intrigued ever since. I've taken a few programs with Hema, including Bhakti Festival in 2015, and every year since then. The first year I took her program, I had the most amazing re-awakening of my femininity. Last year at Bhakti, I had a spontaneous re-alignment during her class. That night I slept like a baby, and have blossomed even more, in the 364 days since then. It's knowing I can let go safely, with her, which allows me to grow. Evolving is a part of life, and embracing every moment is crucial. Hema honors and respects the journey and brings her best self, for our healing. I'm ready to embody the next stage of my journey. 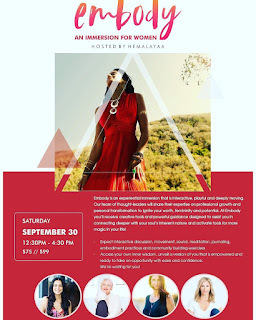 I'll be attending this event at the new Mandala Center in Santa Monica on September 30th. I plan to head over early to enjoy the beach. Maybe plan a meet up for tea? All I know is, I'll be ready. Journal in hand, ready to download the next level of evolution for my spirit. Other Thought Leaders joining Hema are Katie Brauer, Zöe Kors, and HeatherAsh. Register here, don't wait any longer!